Harvey, John. 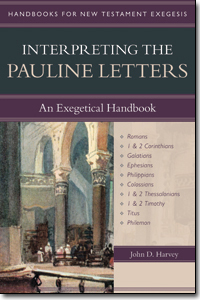 Interpreting the Pauline Letters: An Exegetical Handbook (Handbooks for New Testament Exegesis). Kregel Academic, 2012. The author takes on a great challenge, to provide an exegetical handbook for the Pauline letters. In fact, provides more than an exegetical handbook, including isagogical, hermeneutics, and initial sermon preparation. And he succeeds in this task. Chapter 1 Genre of Paul’s Letters: Harvey sets Paul’s letters into the first century context that includes the oral, rhetorical and literary environments. This is helpful because of the shift taking place in the 1st century between the first and third environments. He offers comparisons to other letters, distinguishing between literary, official, private letters, noting that Paul’s reflect family type letters. In Chapter 2 (“Historical Background”) Harvey provides a brief overview of each letter. Then he lays out a timeline based of Paul’s writings and compares that with a timeline based on Acts. He considers those points which seem to be referenced in both, then explores the issues related to any such matching. Harvey presents an extremely helpful table showing the matching comparison (pp. 69-71). In Chapter 3 the author surveys Paul’s theology. He present four major themes: 1) two spheres “in Adam” and “in Christ,” 2) “faith in Christ” transfers a person from one sphere to the other, 3) common themes in five groupings of Paul’s letters, and 4) the model of “coherence and contingency” is used to understand the theology. The explanations are direct, and neatly summarized in table form for each section (pp. 81, 83, 84, 88). It seems a little surprising that the 4th area of interest is presented by each letter rather than by theological concept. Nevertheless the the information is helpful for the exegetical task. Although Chapter 4 (“Preparing to Interpret”) is a relatively short chapter, Harvey provides a helpful overview of resources and tools to examine and understand the text. In essence, this is a quick review of textual criticism and the hermeneutical process. He then reviews the process of determining what the text means: 1) comparing English versions, 2) Working with interlinears, 3) translating the passage. The only criticism on this is that since the book is primarily for seminary students and pastors, it would make sense to reverse the order. He briefly addresses semantics and syntax. He follows with a sample exercise demonstrating the points covered in the chapter. I particularly like that he poses questions of the text and how each part should be resolved in terms of translation. Chapter 5 (“Interpreting Passages”) seemed redundant at first perusal, offering similar material earlier in chapters. However, he ties together the earlier historical details into the textual study. Further, he moves into the literary analysis of the text. Under “General Context” he urges a synthetic study to get a big picture for a framework to study the text appropriately. He illustrates that with an appropriate table showing the overall framework for Ephesians. Then he provides a structure of the specific passage under consideration (p. 135). He concludes with a short review of three theological tools: the analogy of Scripture, the analogy of faith, and use of the Old Testament in the New Testament. Overall this is a helpful book. Not having read any other volumes in the series, since this was an exegetical handbook I was not expecting isagogical material or sermon material. Nevertheless, the approach worked well. At times I sensed a lack of filling in the gaps for the beginning exegete. For instance, in one section he writes: “It seems unlikely, however,…” (p. 68), which leaves the student wondering “why is it unlikely?” A further exploration of why the author thought it unlikely would have been helpful. Likewise, on p. 138, he states “Those twelve uses fall naturally into three categories of meaning…” The question arises, does the student know this? Is this based on lexical studies (BDAG, GEL, or something else) or is it based on the author’s experience? However, despite these minor annoyances, Harvey is to be commended for providing a solid resource for the beginning exegetical student, and a good review for pastors. Initially I thought that the “be-all-to-all” approach of combining isagogical, hermeneutical, exegetical, and homiletical elements serves to detract from the focus on exegesis, the intended purpose. But after further study of the book and reassessing the stated purpose of the series, I find that this book is a worthwhile contribution to the exegetical task. There are several editing errors in the book, very uncharacteristic of Kregel; I supplied the list directly to Kregel. Note: Thanks to Kregel Academic & Professional for the review copy of this book in exchange for an unbiased review.